This time last season, it looked for all money like FC Dallas would continue their imperious Western Conference form and finish at the summit of what is traditionally the stronger of the two divisions in the MLS. Fast forward to the end of the season and Dallas not only didn't finish at the top, they failed to make the playoffs altogether, and it was clear that the Eastern Conference boasted the superior teams. We certainly didn't pick the LA Galaxy to have their worst ever season and finish at the bottom of the table, nor did we expect San Jose to scrape into the playoffs. It is quite incredible that a team can finish the regular season with a negative 21 goal difference and still make the postseason! Given that the 2017 season was quite tight, it's going to be a real challenge to pick the 2018 table, especially considering we are welcoming a brand new team into the competition. Can Los Angeles FC do an Atlanta United and dominate from the get go? Or will they be more like Minnesota United and ease their way into MLS life? There are plenty of questions that need to be answered. The Rapids overachieved in the 2016 season, although any thought of replicating their success in 2017 was quickly extinguished as Colorado crashed to a 9-19-6 record, finishing just one point above the two worst teams in the league. Pablo Mastroeni was let go midseason as the side only managed three wins by August, and interim manager Steve Cooke oversaw a somewhat respectable finish to the season. Former New Zealand international manager Anthony Hudson is the new manager and has already added a few New Zealand defenders to the squad. Edgar Castillo also joins the club from Monterrey, so there is hope that a new look backline may address some of their 2017 defensive woes. The Rapids do remain light up top, and will surely need to find some attacking talent to ensure the team is competitive this season. We're not convinced that Colorado will improve too much in 2018. A new look defensive unit may take time to gel, their attacking options are limited, and their young coach has barely managed a club at senior level (he has spent the vast majority of his career with international sides). We think this team is a project and 2019 will yield more reward. Many pundits, including ourselves, tipped big things once again for Dallas in 2017. They were one of the top contenders for the MLS Cup, and were heavily backed to top the Western Conference. After the first third of the season, few could predict anything other than FC finishing at the top of the standings, yet their collapse was incredible. Just two wins after July 22nd, with seven losses and six draws, saw them finish outside the playoff positions. Manager Oscar Pareja will continue on, as he deserves considering how dominant his team have been in recent years, and is not sitting on his hands. He has made changes to his backline and is likely to introduce plenty of young players in 2018, most notably Paxton Pomykal. Some have suggested that the veterans in the side may be past their best, although we think they will put in one more good shift to hold off the competition from the younger squad members. We expect a mini-revival for Dallas, and they will make the playoffs once more. They just know how to get to the postseason. 2017 was a fantastic year for the Dynamo, who looked almost unbeatable in the back half of the season. Their run to the Western Conference final was based on a clear counter-attacking tactic that worked all year, until they encountered a strong Seattle side who were destined for a MLS Cup final rematch with Toronto. Still, considering they finished last in 2018 their performance was a great achievement. The obvious question is whether they can continue their momentum into 2018. They are certainly on the right track as they have retained Alberth Elis, buying him outright after his great loan stint in 2017, and did the same with Juan David Cabezas, a rock in midfield. There is plenty of talent, although they still need to add a few more faces or risk a pretty light roster that will be tested by unexpected injury or suspension. The Dynamo will learn plenty from 2017, and we expect them to replicate their form this year. Postseason soccer will return to Houston, and we may even see a Texas derby in the knockout round if our prediction is correct. Wow. What a shambles. Never before has glamour club LA Galaxy played so poorly. 2017 saw the club, who were tipped to finish top four, finish rock bottom and consistently performed well below MLS standards. Giovani dos Santos made a meal of his $5.5 million contract - he scored just six goals all season and was constantly on a total different wavelength to Gyasi Zardes offensively. Defensively, the blame was a mixture of poor form and injury. Jelle van Damme was sent home due to homesickness in mid-August, Robbie Rogers was injured all season (leading to his retirement) and his replacement Pele van Anholt tore his ACL after only five matches. There's obviously a lot of work needed at the most successful club in the history of the MLS, and they've started off on the right track, signing prolific striker Ola Kamara from Columbus, and they are also in hot pursuit of Zlatan Ibrahimovic, which would be a real coup for both the club and the league. Their defence remains shaky though, and they will be certainly involved in some high scoring matches. We think they'll bounce back but not quite make the playoffs. 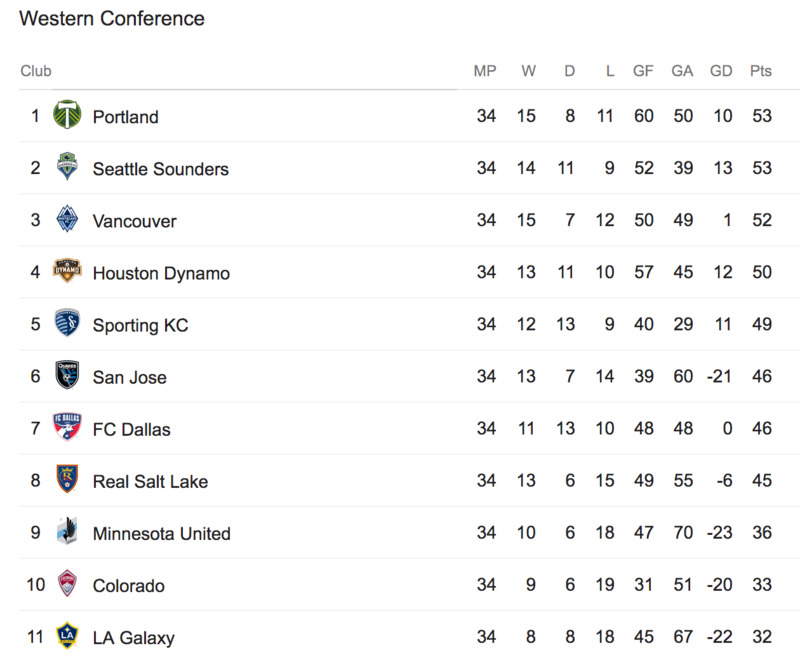 The newest side in the MLS is probably entering the Western Conference at the right time. While it remains competitive, it was well below the pace compared to the East in 2017. They also come into the competition at a time when their most obvious rivals the LA Galaxy are struggling, which will help their plight. Their biggest signing is without a doubt Mexican national star Carlos Vela, who of course played for Arsenal during his career. They also drafted well, prioritising defenders Laurent Ciman, Walker Zimmerman and Steven Beitashour. They will also play at a magnificent new stadium. While Atlanta United showed us what can be achieved in a first season, Minnesota United also provided an insight into how tough the transition can be. The side's lack of depth will likely be addressed as the season progresses, although at the moment it's hard to really gauge how well the side will do. We're predicting a slow start for the newcomers. United's inaugural season started about as poorly as they could have imagined, conceding eighteen goals in their opening four matches and securing just the solitary point. Their form improved and their defence hardened as the year went on, although inconsistency plagued the debutants, and the slumped to a ninth-placed finish. 2018 looks to be another challenging year for Minnesota, who we believe are likely to channel the performances of Toronto FC when they were first introduced to the MLS. They are yet to make any real progress in terms of transfers, and they start their season with just two home matches in their first seven fixtures. Their biggest coup is the retention of striker Christian Ramirez, who performed solidly in the club's first season. We're predicting United to foot the table this season, however given how close the Western Conference has been recently, this is a big call to make. Portland were the surprise leaders of the Western Conference standings after the conclusion of the regular season, coming from nowhere to pip Seattle, Vancouver and Sporting Kansas City, the latter looking certain to finish top with five weeks to go. Despite their great late season run, they were shocked by the Dynamo in the semi-finals, failing to capitalise on a great position. Manager Caleb Porter resigned at the end of the season, which provides an opportunity for Giovanni Savarese to take control of the Oregon-based club. With only the New York Cosmos as a reference point for his managerial career, it will be very interesting to see how well he performs. It's always difficult when the only direction you can move is down on the ladder. Their additions so far have been mostly defensive and we could see a similar attacking lineup in 2018. The only real concern for Savarese will be the Timbers' road form, considering the side lost just twice at home in 2017. For this reason, we believe the club will still make the playoffs despite some early teething problems that will come with a new manager. Soccer is sometimes described as a game of two halves, and that is the perfect way to explain the 2017 season that Real had. Ten losses in the first seventeen matches saw the club sitting alongside LA Galaxy and Colorado at the bottom of the ladder, and while their eight-placed finish doesn't look great, they recovered to within a point of the playoffs. There are plenty of positives to take out of that finish. Salt Lake have made a few moves in the transfer market, most notably retaining Jefferson Savarino after his loan expired. Yet the squad that we saw in 2017 has not changed enough to make us think that we'll see any real movement from RSL. There is a good chance they will start the season in better form, yet there are too many better teams in the league right now and we can't see a playoff trip here. How this team made the playoffs last season is totally beyond us, and certainly had us thinking that having six teams make the playoffs from a conference of eleven rewards poor teams. The Earthquakes finished with an awful goal difference, and lost more games than they won, yet somehow reached the postseason with a miracle last minute goal in the final match. They were put out of their misery in a hurry by a rampant Vancouver side in their elimination fixture. There is plenty to consider when looking at Real Salt Lake's 2018 season. They have a new manger, Swede Mikael Stahre, and the former BK Hacken coach has a more than decent 98-53 win-loss record over his career. They have brought in another Swede as designated player, midfielder Magnus Eriksson, and also Danny Hoesen from the Netherlands. The club certainly needs to put a bigger emphasis on defence in 2018, and we're not sure if the club can turn things around just yet. We actually believe they will struggle. Seattle were impressive in 2017, thanks mainly to the return of key man Clint Dempsey. After missing the majority of 2016 through a heart condition, the talisman more than made up for his absence with a twelve goal haul in the regular season, and almost helped the club to their second consecutive MLS Cup victory - they finished runners-up to champions Toronto FC. Dempsey will return in 2018, as will the majority of the side that lined up in last year's final. The key to the Sounders' great run over the past few years has been the consistency of their squad and their immaculate defence, and we are sure to see another solid year from the green machine. The re-signing of goalkeeper Bryan Meredith is also a massive bonus. The Sounders will make the playoffs once more, the only question is whether they can go on a run and make a third consecutive MLS Cup final. KC finished fifth in the standings last year, which was a massive surprise considering they had led the conference for much of the year. They lost just nine matches, which was the equal-best in the West, although their inability to convert draws into wins cost them in the end. Their miserly defence saw just 29 goals conceded, the best record in the entire MLS, yet their lack of productivity in attack saw them 18th in the league in terms of goals scored. Kansas have moved to rectify their lack of potency in front of goal by signing forward Johnny Russell from Derby County in the English Championship, although they probably are short of one key frontman. Given their defensive resolve, we feel as though they will always be a chance in a league where few teams defend with purpose. Our prediction for first place may be controversial, however Sporting were close to finishing top of the standings last year thanks to their immaculate defensive record, and they will only need to improve slightly in attack to dominate the competition. Canada's sole team in the West surprised many last season with a third-placed finish, and it could have been even better for the Whitecaps, who led the standings in the final weeks before being pegged back. A conference semi-final finish was great considering the side ended 2016 in eighth place, although Vancouver would have been disappointed with a loss to rivals Seattle in the postseason - they have never progressed beyond that point since their debut season (2011). The Whitecaps will have to cope with losing their leading scorer in 2018 - Fredy Montero departed the club in the offseason in a move to Portuguese club Sporting Lisbon. Kei Kamara is the man they hope to replicate Montero's efforts in front of goal - he was picked up from the Revolution - while they also have gained Canadian national team defender Doneil Henry and former Mexican national team midfielder Efrain Juarez, who will be key to the side's success. Without Montero, we feel the Whitecaps may struggle early, but recover to make the playoffs. They are definitely one of the competition dark horses in 2018, and could go on their best MLS postseason run. Watch this space.